Connect the battery (+) to the terminal 1 (+1) of the connector, the battery (-) to the terminal 5 (E) of the connector, and check that the motor operates at low speed (LO). Connect the battery (+) to the terminal 4 (+2) of the connector, the battery (-) to the terminal 5 (E) of the connector, and check that the motor operates at high speed (HI). Connect the battery (+) to the terminal 1 (+1) of the connector, the battery (-) to the terminal 5 (E) of the connector. 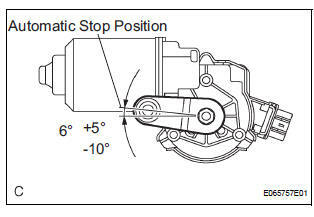 With the motor being rotated at low speed (LO), disconnect terminal 1 (+1) to stop the wiper motor operation at any position except the automatic stop position. Using SST, connect the terminal 1 (+1) and 3 (S), and the battery (+) to the terminal 2 (B) to restart the motor operation at low speed (LO). Check the automatic stop position.